Multicoloured South Sea cultured pearls with white diamonds, multicoloured sapphires, and tsavorite garnets in a necklace from Assael’s ‘Tropical Luxe’ collection. Combining cultured pearls with coloured gems offers many benefits. It not only allows jewellers to make one-of-a-kind pieces and expand their jewellery lines, but also helps them add contrast to their coloured gem jewellery while making it more affordable. Cultured freshwater pearls are a less expensive accent than diamonds or moonstone, for example, for the ruby necklace by Gloria Bass on this page. Similarly, gemstones can add contrast to pearl jewellery. In a piece by New York designer Chris Davies, lapis lazuli highlights golden South Sea cultured pearls and turns them into one-of-a-kind earrings. 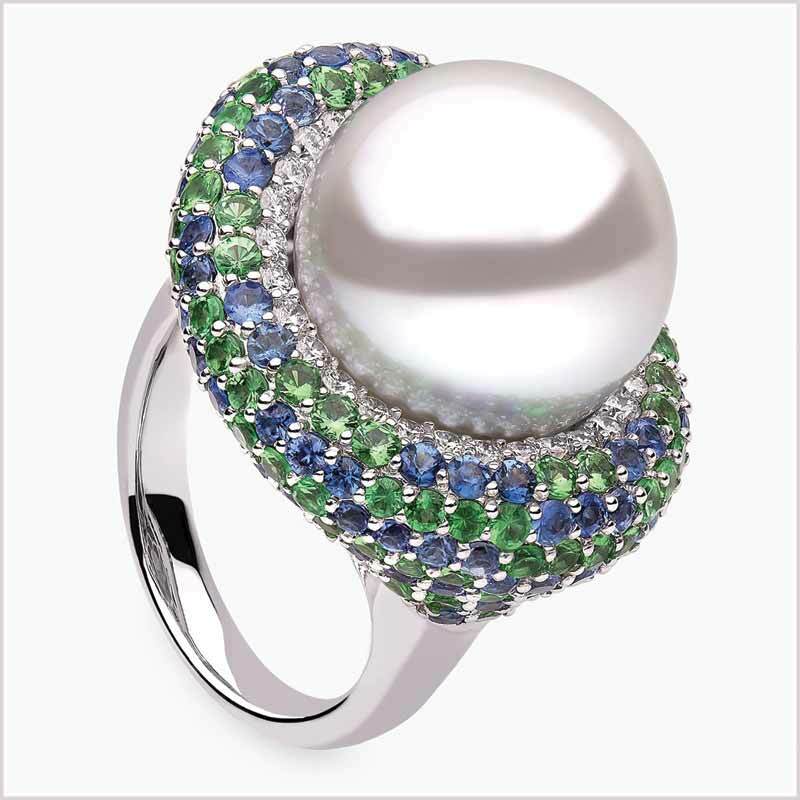 Tsavorites and sapphires also add colour to Yoko London’s white South Sea cultured pearl ring in Figure 1. Even when they are not used as contrast with white pearls, coloured gems allow companies like Assael to add sparkle and brighter colours to their jewellery. 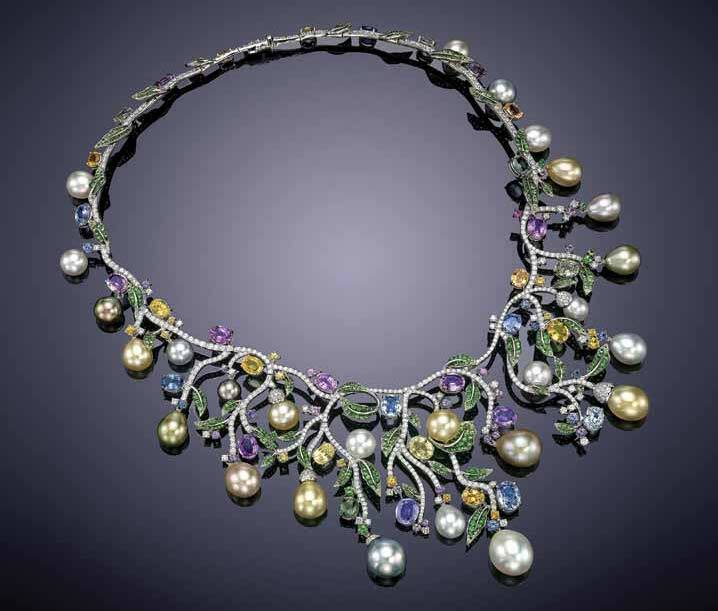 In one example, multicoloured South Sea pearls were set with tsavorites and blue and fancy colour sapphires to create a stunning necklace. 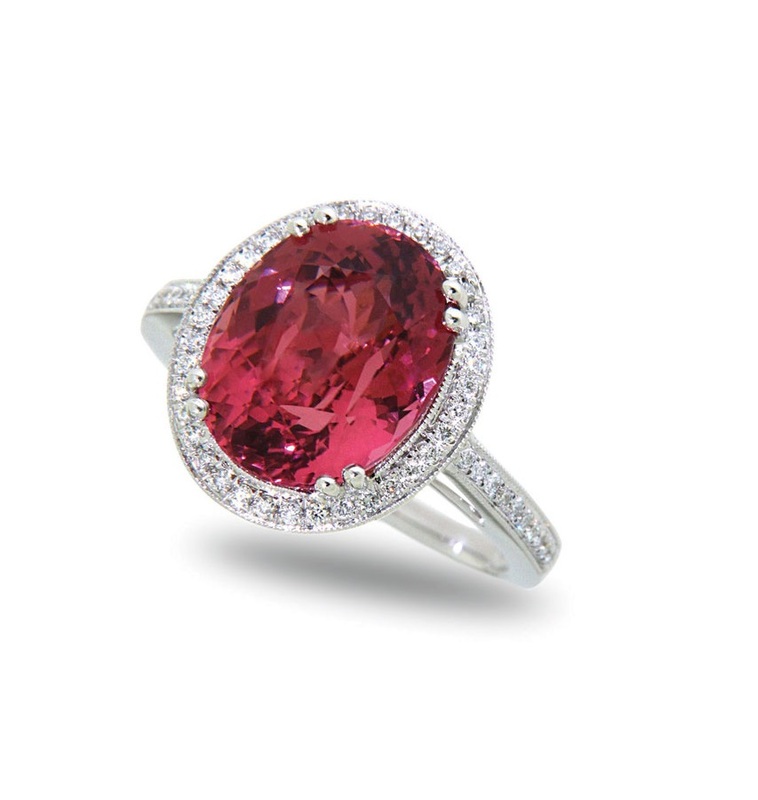 It attracts more attention with the addition of coloured gems than if it only consisted of cultured pearls. Coloured gems are increasingly being used to change the appearance of cultured pearl jewellery and even the pearls themselves. 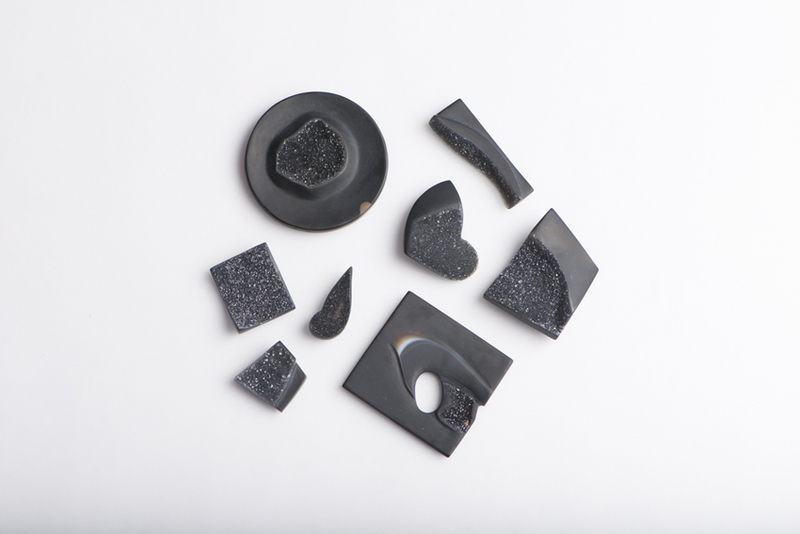 Designer Hisano Shepherd, for example, inserts chunky to melee-size coloured gems into cultured freshwater soufflé pearls that have been carved to fit the stones. A soufflé pearl is a hollow pearl that has been nucleated with a dried, hard piece of mud. As the pearl is forming, water seeps into the area with the nucleus and dissolves into the hardened mud. When the pearl is drilled, a liquid drains out from it, leaving a hollow area with very thick nacre walls that can be carved to hold gems. Figure 1: Ring by Yoko London with Australian South Sea cultured pearl (15 to 16 mm [0.5 to 0.6 in.]) 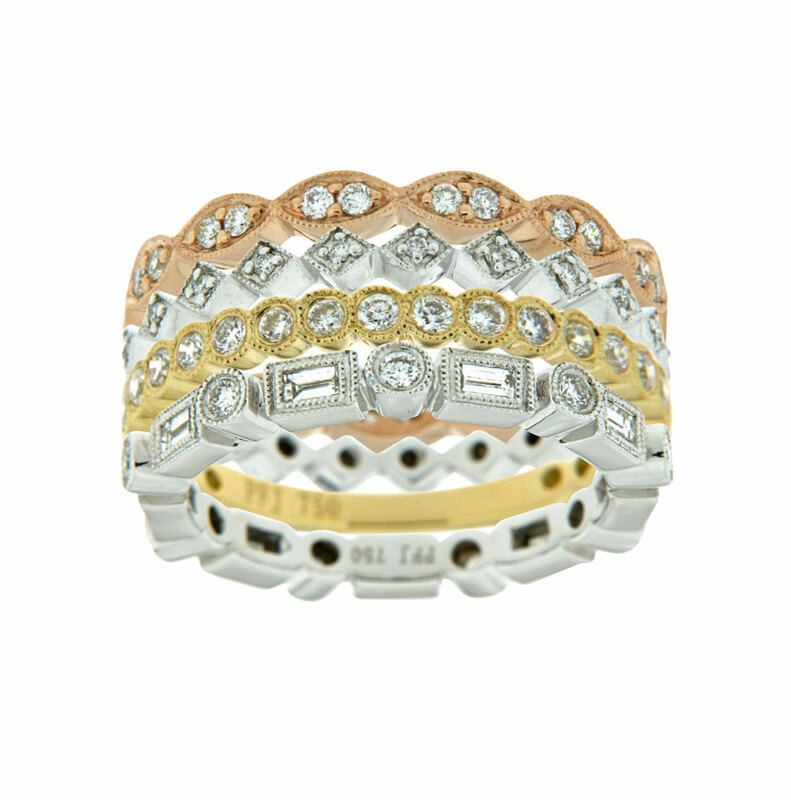 encircled with sapphires, tsavorites, and diamonds. Figure 2 shows another example of how designers can enhance a pearl using coloured gems. A hand-carved 16-mm (0.6-in.) 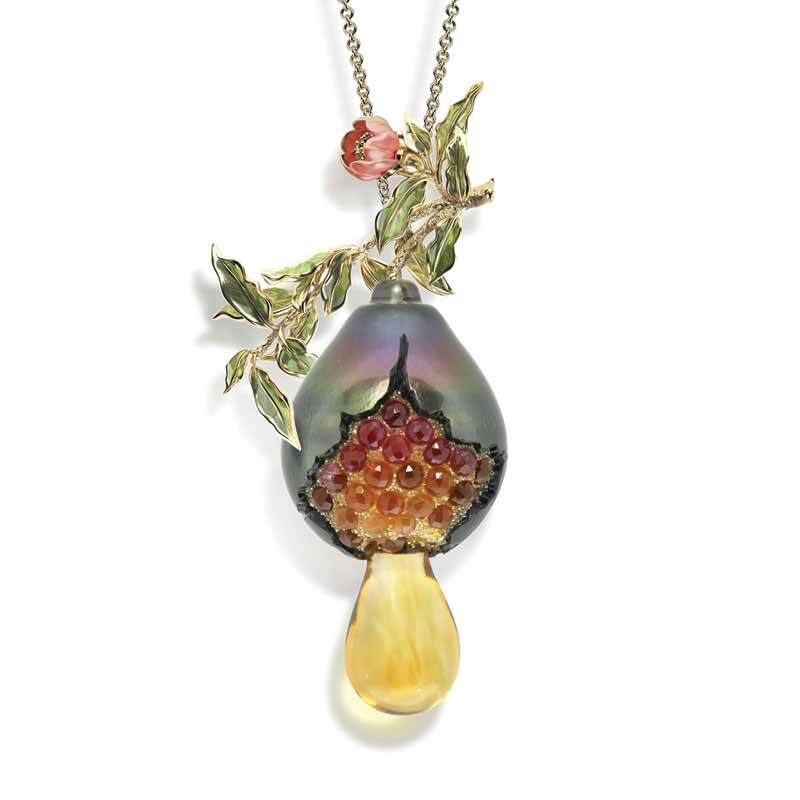 Tahitian cultured pearl is filled with ruby, citrine, and pink tourmaline ‘seeds’ and yellow lab-created diamond druzy ‘pollen,’ which is further accented with a citrine drop, a pink enamel flower, and green enamel leaves. Designer Ana-Katarina Dervisevic turns a Sea of Cortez cultured mabe pearl into a double ring by looping it to meet a Brazilian aquamarine hand carved into a cloud. Pearls from the Sea of Cortez (Gulf of California) usually form in the rainbow-lipped oyster (Pteria sterna) and are noted for their high lustre and rainbow-like colours. A few are natural, but most are cultivated at a sustainable pearl farm near the city of Guaymas, Mexico, named Perlas Del Mar de Cortez. Cynthia Renée makes her designs more versatile by adding cultured pearls and/or coloured gems to interchangeable jewellery. She offers South Sea cultured pearls that can be worn alone as drops or studs, or as drops with tanzanites and yellow sapphires for a dressier look. 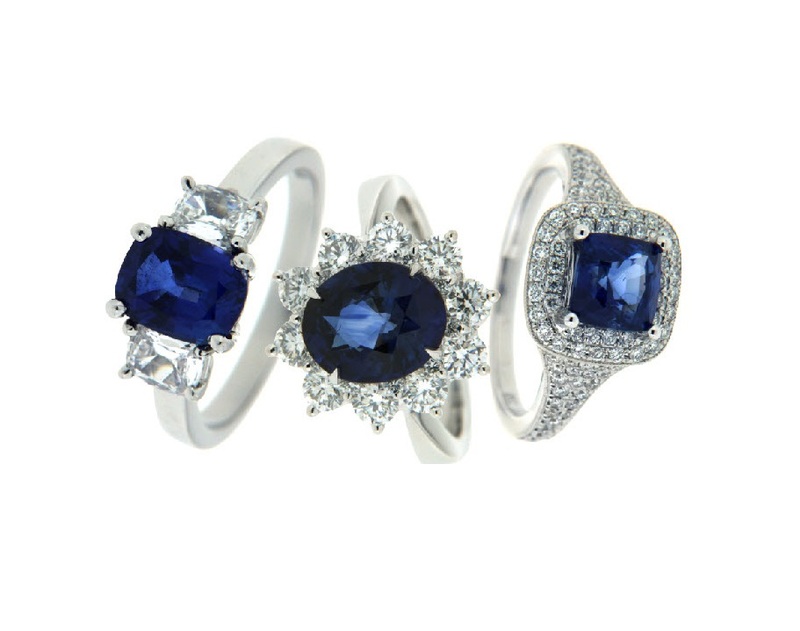 The sapphire, tanzanite, and diamond earrings can also be worn by themselves. The multi-pearl drops in the bicolour tourmaline earrings by Assael are also detachable. Gemstones from clients’ old jewellery are sometimes used for convertible earrings like these and combined with pearl types that fit the budget and preference of the client. Figure 2: ‘Sweet Nectar’ pendant by Galatea. Coloured gems can also be added to pearl jewellery to turn it into a local product. For example, Spectrum Award-winning designer Naomi Sarna offers an Oregon sunstone and cultured freshwater pearl necklace that would be ideal for a local gem and jewellery display in Oregon. Similarly, Alison Larson of Pala International created a ‘North American Wonders’ pendant with Canadian diamonds, Yogo sapphires, a Montana yellow sapphire, and a natural pearl from Baja California. Displays including gems from one’s province or state allow independent jewellers to distinguish themselves from chain stores that sell the same type of merchandise at all their locations. Jewellers can also attract clients to their stores by creating pearl and coloured gem jewellery featuring the colour themes of local sports teams, for example. 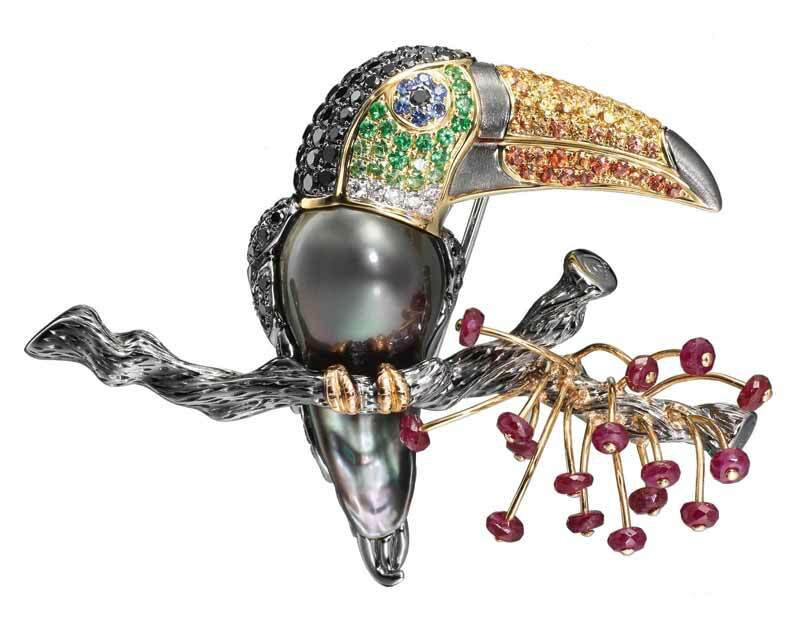 The Rio Pearl Company in Hong Kong uses coloured gems with its pearls to depict various creatures and art objects. 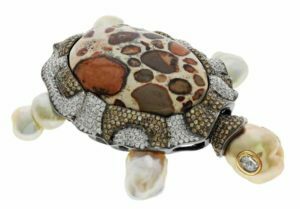 Its turtle brooch, for example, was created with cultured South Sea pearls, brown diamonds, and a shell made of jasper. Another of its brooches features a Tuscan bird with a Tahitian pearl body and a head and beak set with fancy sapphires, green garnets, and black diamonds next to some ruby ‘berries.’ Adding coloured gems to its pearl jewellery has helped Rio Pearl expand its product line, receive free media publicity, and attract new customers and web visitors, thereby increasing sales. Fifty years ago, pearl jewellery was typically white. Now, times have changed. Today’s pearls come in a wide range of colours and they are set and strung with all types of coloured gems. This allows designers to create new jewellery lines and make pearl jewellery more colourful, versatile, and distinctive. If you or your customers have gemstones that are just sitting in drawers and jewellery boxes, consider combining them with pearls to make jewellery that can be classic, dazzling, casual, or elegant. You’ll expand your inventory and your customers will have one-of-a-kind pieces they helped create. Renée Newman, GG, is a gemmologist and the author of the Pearl Buying Guide and 12 other books on jewellery and gems. She became interested in pearls while conducting tours to Asia, Tahiti, and Australia in the early 1980s. To answer her passengers’ questions about the gems there, Newman enrolled in the Gemological Institute of America (GIA) gemmology program. 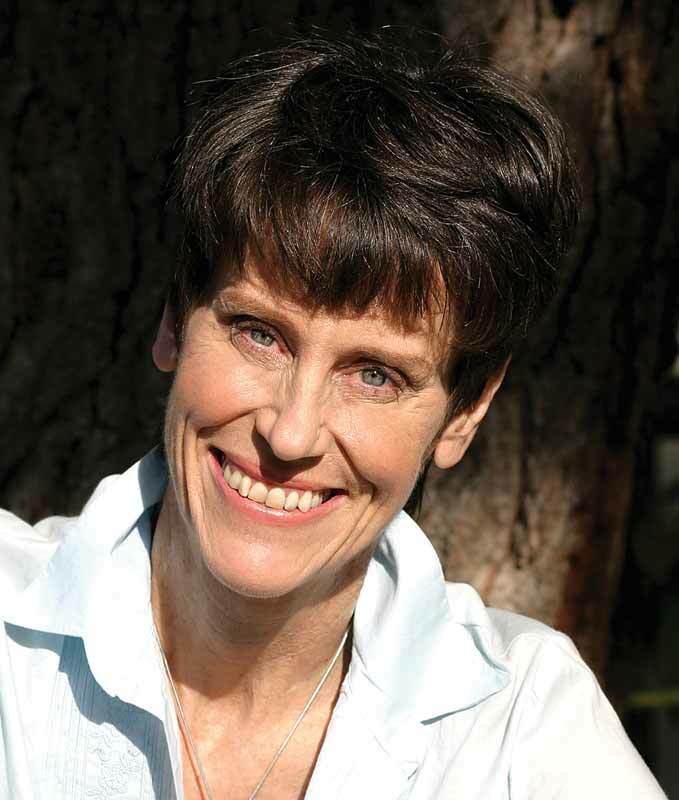 After graduating, she was hired as a gemmologist at a diamond and pearl wholesale firm in Los Angeles, and now devotes most of her time to speaking and writing about gems and jewellery. Newman can be contacted by visiting www.reneenewman.com or e-mailing the address renee@reneenewman.com.